Do You Have FAQs About Dental Implants? If you’ve lost a tooth, then you need to discuss possible replacement options. Otherwise, the health and appearance of your smile can suffer. In many cases, we replace lost teeth with a dental implant, which looks and functions like a natural tooth. Do you have questions about dental implants, such as candidacy or the placement process? Question: What makes a good candidate for implant placement? Answer: We will need to assess your current health and examine several factors. First, do you have enough jawbone tissue to fully support the new tooth? If loss of jawbone density due to tooth loss has eroded your jawbone’s strength, then you may need a bone grafting procedure first. We will also look at your gum health. The presence of periodontitis, or advanced gum disease, can lead to implant failure. We need to help you manage the disease before discussing tooth replacement. Question: How do you receive one? Answer: We will work with an oral surgeon, who will insert the implant post into the jawbone. After the area heals over the course of three to six months, we will restore the post. We first add an abutment, which holds the dental crown in place, completing the visible portion of your new tooth. Question: Will the new tooth look natural? Answer: Yes. We use ceramic crowns for restoration, which look completely natural and have the ability to blend with a patient’s smile. 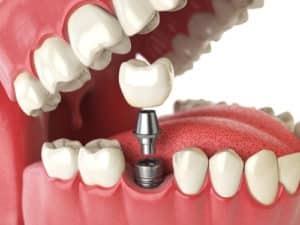 Question: How do I maintain my dental implant? Answer: With a focus on preventive dentistry. In addition to seeing the periodontist for regular exams and cleanings, you should also be brushing and flossing at home.